Lakefront Cabin w/ Private Beach, Dock, AC, 4 Boats, Sauna, Dog Friendly!!! Check out our video walk through in the picture gallery(3rd picture). If you click on picture 25 of 25 above you will see a video walk through starting at the street, walking through the house and finishing at the water. Well behaved dogs are welcome with prior permission.. We do have a $100. pet fee per dog. Three dog maximum. 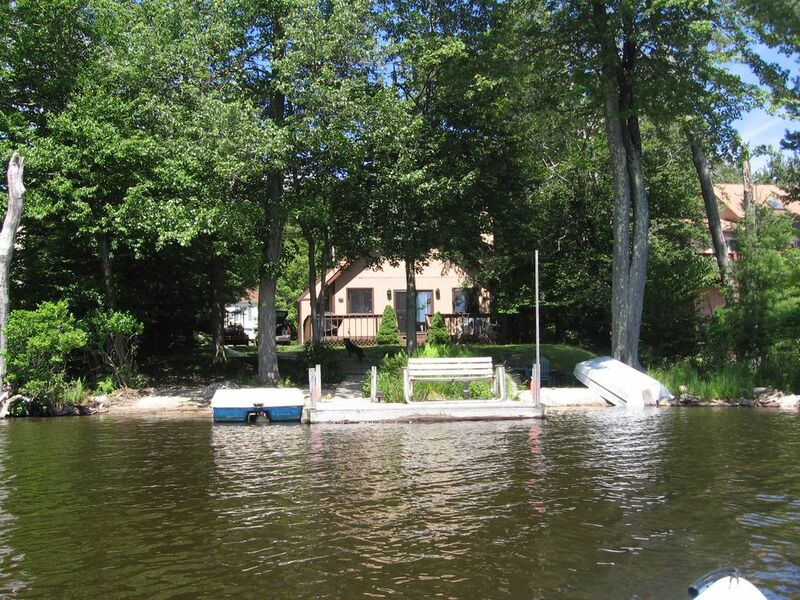 Check out our other Pocono Lake Front House by typing 3499507 or Long Beach Island Beach House 4854600 in the Home Away search bar. Also, feel free to call us....(908)874-6800(home), or (908)202-5800(Nicks cell). Jill and I live in New Jersey, have 2 kids and have been married since 1989. We believe vacations are precious and want you to stay at a 'home' not just some vacation house. We've owned this house since 2008 and we've tried to make it a home away from home. There is something about this house that just makes you kick back. I don't know if it's the style, the beachy-country feel or what...I'm not sure. It's just that way. Our other house(check out HomeAway #3499507) has a completely different feel to it. Location, Location, Location. Whether it's boats in the summer or just not having houses in your back yard have a house on the lake makes all the difference. The house is 50 feet from the water with no obstruction between the house and the water. The Lake is 1 mile left to right and 1/4 mile across and never crowded. Four unit mini-split AC system. Each room has it own unit and thermostat. Each room has individual heat control. High speed cable modem with wireless router. The kitchen comes fully equipped with a microwave, dishwasher, fridge, coffee pot, utensils etc. There is a New 3 Burner gas grill provided on the back deck and table and chairs so you can enjoy meals lakeside. The lake is 50 feet from the deck and is stocked annually. Private Dock with Paddle Boat, Row Boat with Oars and 12 volt Trolling motor, One and Two person Kayaks, Inflatable Raft and pump, life Vests, Fishing Poles, Tackle Box and nets. Fire Pit, Horse Shoes, Cable TV. DVD player, XBOX and games. Washer and Dryer,ironing board & iron,Wood Burning Fire Place. A wonderful spot with lovely lake views. We enjoyed a very relaxing get away, and our dogs loved it too. The weather didn’t cooperate unfortunately and the lake was frozen for the duration of our stay so we’ll have to come again to fish and enjoy more than the fabulous view :) Thank you for sharing your home with us. My wife and I, son and daughter-in-law and their 2 little doggies shared this amazing vacation which began as soon as we pulled into the driveway. From boating and fishing to grilling on the Weber or over the fire pit, from sitting in the living room in front of the fire place to sitting on the glider on the dock enjoying the gorgeous and serene views of the lake, from long walks on brisk mornings to relaxing in the sauna, from the peaceful solitude to laughing and loving our family get together, from bird watching to watching the deer leisurely walking through the yard, sun out, moon out, clear days, rainy days, and fog rolling in on the lake, it was MAGICAL! I can't thank the owners, Nick and Jill, for their graciousness and desire to provide the kind of vacation experience where MEMORIES ARE MADE. WE LOVED IT. Perfectl peaceful and serene setting. Perfectly located right on the lake. Enjoyed swinging on the dock and the firepit in the evening. The suana was a very nice feature. All the amenitities of home. Was a wonderful time. Great place for a vacation ! We had a fantastic time at the cabin on Lake Carobeth. House was beautiful and cozy. Weather was great ! I would difinitely rent the cabin again ! Also being pet friendly, my dog Moose loved it. Cool at night made for great sleeping. With fans in each room didn’t need AC ! Stores are nearby so everything was easy access and with all the amenities it was just perfect ! What a fantastic place to relax. Nick and Jill made sure that we had everything we needed for a great time. We enjoyed our time on the lake with the kayaks, pedal boat, and inner tubes provided for us. [My first time in a kayak!] My dogs loved getting into the lake to paddle around too. We will be sure to return here. Beautiful place, great owners, definitely best lake vacation we ever had. Owners have everything already at the house even firewood. House was cozy and clean. courts, 2 bocce courts, 5 playgrounds and 4 club houses. 6 badges included to enjoy the facilities. Camel Back(10 miles), Jack Frost and Big Boulder(20 miles) ski areas are just a short drive. Lodge(5 miles), Horseback Riding, Snowmobiling and more! Home Away's "Quotable Rates" system does not work. Please email for the real rate. Dogs permitted with prior permission. Pet Fee... $100/dog 3 dog maximum. Cleaning Fee $75 $300 Refundable security deposit required. Contact us for Holiday Rates. Primary renter must be at least 25 years old. Maximum occupancy 8 persons Summer rentals are from Friday to Friday. Personal check - If payment is sent early enough to clear bank. Home Away - Credit Card or PayPal Until confirmed, rates are subject to change.